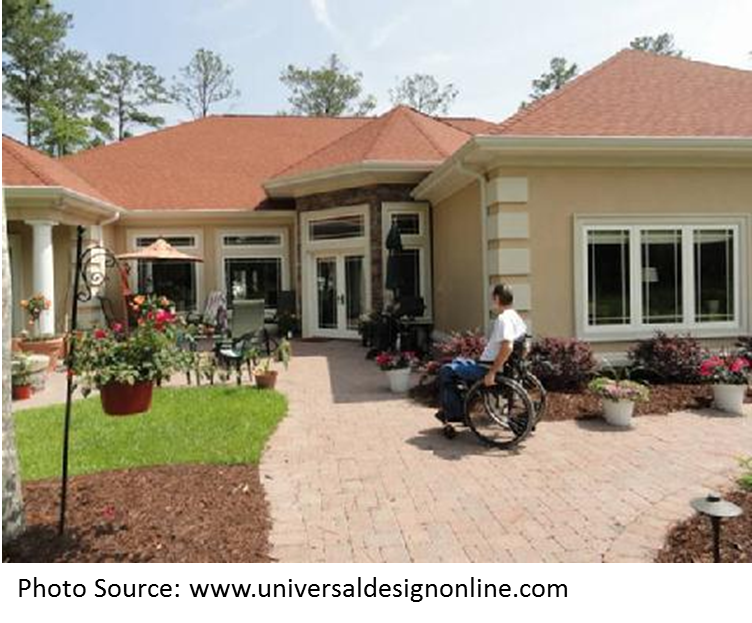 Is Universal Design For You? Universal design is the design of products and environments that is usable by all people without the need for adaptations. Some people use the term “aging in place”. Owning a home is a huge investment but so many reach that goal only to find later it’s not user-friendly as they age and their physical limitations prevent them from using most of the features in the home they originally loved. In addition the need to remodel usually comes at a time when people are on fixed incomes and cannot afford it. Other events such as accidents or illnesses can make it difficult to remodel as money is flowing out to the medical field while on a drastic time limit. The answer, of course, is to be proactive in design when you buy your home or remodel your existing one. The best time is while you are still working and can afford it a little at a time. No step entry. No one needs to use stairs to get into a universal home or into the homes main rooms. One story living. Places to eat, use the bathroom and sleep are all located on one level, which is barrier free. Wide doorways that are 32 to 36 inches wide let wheelchairs pass through. They also make it easy to move big items in and out of the house. Wide hallways. Hallways should be 36 to 42 inches wide. That way, everyone and everything moves more easily from room to room. Open floor designs. Everyone feels less cramped. And people in wheelchairs have more space to turn as well as people using walkers. Floors and bathtubs with nonstick slip surfaces help everyone stay on their feet. They’re not just for people who are frail. The same goes for handrails on steps and grab bars in the bathrooms. Thresholds that are flush with the floor that could make it easy for a wheelchair to get through a doorway as well as walkers. Good lighting helps people with poor vision. And it helps everyone else see better too. Lever door handles and rocker light switches are great for people with poor hand strength. But others like them too. Try using these devices when your arms are full of packages. You’ll never go back to knobs or standard switches again. As a society we are proactive in so many other areas like insurance, retirement savings, yearly wellness checks and we also need to be proactive in keeping our independence and freedom to stay comfortable in our own home by making these changes. Aging happens to all of us, it is inevitable, and by preparing for it we also prepare for any other physical changes that may come down the pike before retirement. Many people end up in nursing homes waiting on remodels to happen so they can go home. Don’t let this happen to you. There is much more you can provide that can make your house user-friendly to all ages and all people in your family. This entry was posted in aging community, Disability, Society and tagged aging, Disability, surviving life.